When your business needs a piece of content written, you have three choices: 1. You can write it yourself; 2. Your employee can write it; or 3. You can hire a content writing service. This is the obvious reason to hire a content writer – to have content written. But a content writing service can do so much more for your company than filling up blank pages, text boxes and empty websites with words. Writers are not just the people who sometimes (annoyingly) correct your grammar at board meetings and dinner parties; they are also artists, creators, inventors, resilient researchers, idea-machines and brand-awareness generators. For content and branding that sparkle like diamonds, put your writer’s multi-faceted talents to work in unexpected ways. Give your audience a reason to return to your website and social media pages time and again by posting fresh content and new ideas. If you run into a case of writer’s block or find yourself stuck in a topic rut, a content writing service can help you through with creative angles and different perspectives. With a clockwork content writing service, you will never again fall behind your marketing campaign schedule. Post new content on your website, blog, social media pages or in email newsletters as often as you want without draining your time or energy. With content available anytime you need it, you can post about fall while it’s still fall, have content ready for the holiday season and even start preparing for summer. Use a content writer to help you write a script for a short video or podcast to distribute your brand everywhere. With well-written, high-quality content published consistently, you can delve into in-depth topics, improve chances of publication with prominent outlets and position your business as a thought leader in your industry. Content writers can help your brand try on new voices. A new voice – whether it be more authoritative, comedic, journalistic, youthful, wise, feminine or masculine – can help you reach a new audience to expand your company’s market. In our technological time, content is everywhere. So, your brand should be everywhere your customers are, too. With the help of a content writing service, your brand can do the impossible; it can be in thousands of places at once. Think social media, blogs, video, audio, inboxes, mailboxes, print and advertising. 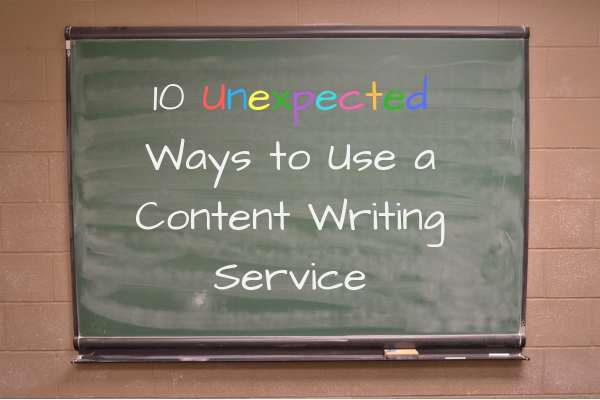 Most business owners think hiring a content writing service will be an added expense. Although these services do not come for free, a content writing service is likely the least expensive and most effective option – especially when compared to hiring a full-time, in-house writer. The latter are paid for their time in the office, rather than the number of words they write. In-house writers also cost more than their salaries alone, when you consider vacation and sick days, insurance expenses and other over-head costs associated with hiring and training an employee. With a professional content writing service, your company can have the skills of an entire team of writers at its disposal at a fraction of the cost of hiring a single in-house writer. Use content to get your audience talking about your brand, product, service or something else. Depending on your company’s personality and brand persona, consider using content to start conversations about popular culture, current events or hotly debated topics, like the proper way to install the toilet paper roll. Anything that creates buzz around your blog or social media pages will also create buzz around your business. Since the days of looking up entries in actual encyclopedias and researching newspaper articles on microfiche, writers have been masters in the art of recycling content. Ask your writer to refresh your web content (which could help your search rankings) or to approach old topics from a new angle. If you are not yet ready to hand your content-writing reins over to a content writing service, consider at least hiring a service to provide a professional edit. This way, you can continue writing all of your own content, while working closely with a professional writer or editor to ensure you deliver clear, readable prose, which your clients will enjoy taking time out of their own days to read. With countless writers who specialize in every industry and a variety of writing styles, WriterAccess offers its clients a bottomless well of content creativity. The next time you hire a content writing service, step outside the box and ask your writer to write between the lines to get more than words on a page.